Titian did not live starving and penniless in an unheated artist’s garret. He was wealthy and famous in his own time — more Andy Warhol or Damien Hirst, at least as far as the fame game goes, than Vincent Van Gogh. At least partly, that’s because he had a good press agent. Mr. Scatter has been spending some time lately communing with the great Venetian High Renaissance artist, because Titian’s 1536 portrait of an unknown lady, La Bella, has taken up temporary residence in the European galleries of the Portland Art Museum. You can read about it in Mr. S’s cover story from this morning’s A&E section of The Oregonian. Martha Ullman West, Art Scatter’s most highly paid correspondent, tipped us off to the key role played in Titian’s life and career by one Pietro Aretino, a man known with less than complete enthusiasm in certain circles as “Scourge of Princes.” Historians have acknowledged Aretino also as a scabrous satirist (hence the “scourge”), a pornographer and a proto-feminist, a playwright and poet, and one of the finest art critics of his day. That’s why they called them Renaissance men. Pope? Elephant? Pope Leo had been given an elephant by the king of Portugal (apparently a dozen roses and a box of chocolates wouldn’t do) in 1512, and a couple of years later the beast died. Leo was heartbroken — “the Papal grief reached the heights of the ridiculous,” as Martha noted — and Aretino wrote a satirical piece about the ill-fated relationship. His bit of wit made his reputation. Titian and Aretino met in 1526, and the canny Aretino was soon making connections for the great painter (and others, as well) across Europe, at one point even guaranteeing payment from an important but recalcitrant patron by a well-placed threat. Press agents do have their methods. They were close friends for thirty years, and in fact, Titian was the only friend with whom Aretino did not have a serious quarrel. Between the two men there was a sharp difference in temperament and background that makes the relationship a remarkable one. Aretino, with his background of a city slum, was arrogant, gregarious, intemperate, impulsive and completely unscrupulous. Titian, who came of mountain stock, was reserved, refined, and showed measured judgment and good taste in everything he did. He had an inherent sadness that was completely lacking in the character of Aretino. 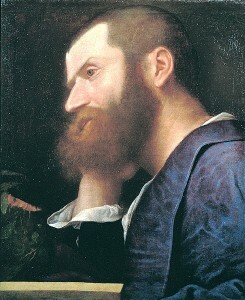 ILLUSTRATION: Pietro Aretino, first portrait by Titian, at the Galleria Palatina in Palazzo Pitti in Florence. Wikimedia Commons.